Originally launched back in April of 2012 on Xbox Live Arcade, Fez is a 2D platformer with puzzle elements that hinge around being able to rotate the game world in 3D space. Since its initial release Fez has been ported to practically every platform under the sun, and in the process has won an absurd amount of awards. Fez is one of those games that it really doesn’t matter where you play it, as long as you’re playing it somewhere. This morning Fez – Pocket Edition ($4.99) was released on the App Store, providing a fabulous opportunity for fans of Fez to experience this gem on to go, as well as folks who potentially never heard of the game to play it for the very first time. The basic premise of the game is you play as a tiny white character named Gomez. Within a few moments of playing, you’re given a magical fez which unlocks the secret of Gomez’s universe: His 2D world actually exists on one of four sides of a 3D world. By swiping the screen right or left, you rotate the game world and expose a new 2D plane to explore. The story (and gameplay) then revolves around collecting cubes and their fragments to restore balance to the universe. There’s a lot more to it than this, particularly in the early game, but I’m leaving this intentionally vague to not spoil any surprises. After you get your bearings, and effectively play through what amounts to a cleverly disguised tutorial, the game really opens up and you’ll be hunting these cube fragments all over the place. It’s shocking how many different pathways can be hidden and revealed by rotating the game in 3D. For instance, you might jump to a tiny platform, but then when you rotate the world to the right or to the left, that platform actually turns out to be a longer pathway that leads you to an entire new set of platforms you can jump up. As the game continues, new levels introduce additional complications through hidden passageways, switches, backtracking and so much more. Also, should you choose to dive deeper into the game, there’s just a dumb amount of secrets to discover. I’m reluctant to get too deep into specifics, as solving the game’s riddles is a massive part of Fez’s end-game. If you come across some things that don’t make sense, just make note of them, and continue on. Everything will eventually come together, and if it doesn’t, there’s loads of guides on the internet unraveling absolutely every mystery inside of Fez. 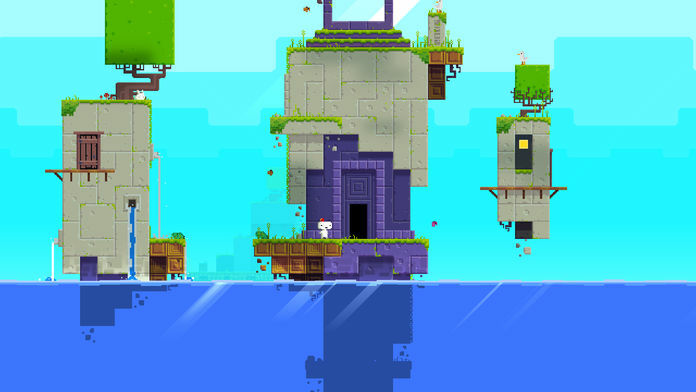 Platforming does get a little complicated, but Fez is an unbelievably forgiving game for how challenging it gets. Basically, if you miss a jump and die, you just start back where you were before you took that leap. This initially felt a little odd in the original Xbox 360 release, but this mechanic is unbelievably welcome on mobile- Particularly when you throw in the inherent imprecision of virtual controls into the mix. On top of Fez’s beautiful game world is a set of virtual buttons which handle all of your movement and actions in the game. They work… about as well as you’d expect. If you’re the kind of person who never has problems with virtual controls, chances are you’ll blast right through Fez on mobile with similar ease. If that doesn’t describe you, you’ll be happy to hear that Fez – Pocket Edition also features full MFi controller support. Once you pair your controller, the game automatically detects it, and the whole gnarly virtual control UI disappears. That being said, if you don’t have an MFi controller, playing through the game using virtual controls isn’t that bad, largely due to the way the game handles death. If you missed a jump and as a result you lost a life and started over from the beginning of a level or some other checkpoint, Fez on mobile would be super difficult to recommend. Instead, you effectively lose no progress, making the trial and error of navigating the game world with virtual controls infinitely less frustrating. Additionally, a lot of the in-game platforming puzzles typically lean more on figuring out what you’re supposed to do, how to rotate the world, and other things rather than ultra-precise jumping. A somewhat baffling thing about this port is that it is not optimized for the iPhone X, like a surprising amount of other “high profile" releases we’ve seen since the new iPhone launched. I’m wondering if this isn’t some of the cause of the problems I’ve been having with the virtual controls, as without the weird black border around the screen it seems to play a lot better on my iPad. Either way, it just seems strange, and hopefully an update is released soon. Thankfully, iCloud save syncing is supported, so passing off progress between your iPhone X and iPad isn’t a big deal. Fez is a very good game, and I love how the player never really faces any consequences for failure. It goes a long way in creating an experience that’s fun from beginning to end, instead of being loaded with frustration because you ran out of continues and missed a jump. The virtual controls are basically in line with most other games that have reasonably decent virtual button configurations, but the “real" way to play Fez is with an MFi controller. Whether you pair a controller, or wrestle with virtual buttons, as long as you’re actually playing Fez, you’ll be in for a great time.